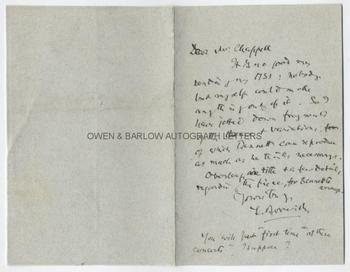 LEONARD BORWICK Autograph letter Signed. ALS. 2pp. No place, no date. To [Samuel] Chappell. "It is no good my sending you my MSS: nobody but myself could make anything out of it. So I have jotted down fragments of the theme and variation, of which Bennett can reproduce as much as he thinks necessary. Overleaf are title and a few details regarding the piece for Bennett to arrange. Yours truly, L. Borwick". [He continues on a separate leaf of the bifolium:-] "Andante with Five Variations. Written by Mozart in 1786 for a toy clock or musical box. Published during his lifetime as a Duet for four hands in G major. The score cannot be traced, but it was written probably in the same manner as a much later work - the Fantasie in F minor (1791) which was composed for a similar mechanism and of which the score exists - i.e. on four staves treble and bass. 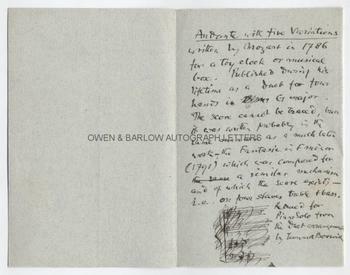 Reproduced for Piano Solo from the Duet arrangement by Leonard Borwick" [Here Leonard Borwick incorporates a small drawing showing the arrangement of the musical staves]. Leonard Borwick was one of the 19th centuries leading concert pianists, being particularly associated with the piano works of Schumann and Brahms. 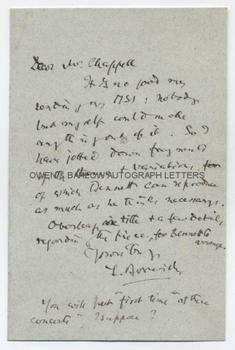 He is here writing to Samuel Chappell in connection with the latter's renowned Monday and Saturday Concerts at St. James's Hall (known as the 'Pops' and Ballads Concerts). The Bennett referred to in the letter is Dr Joseph Bennett, the music critic, choral conductor and librettist, who was often called upon to provide learned programme notes for St. James's Hall, the Philharmonic Society and other concerts.